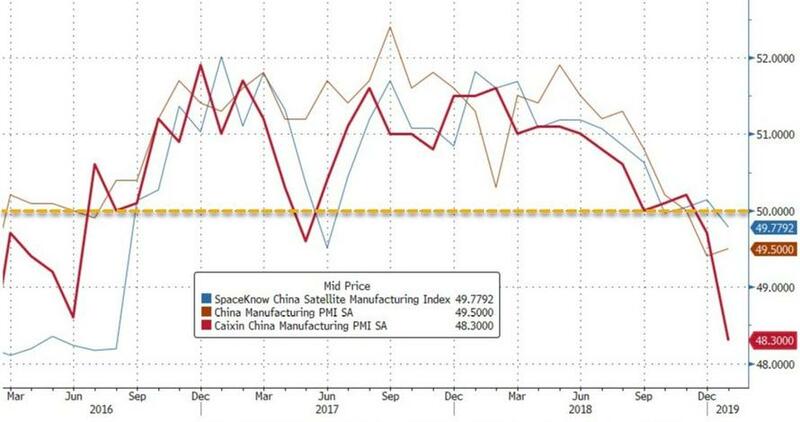 One day after China's official manufacturing PMI number printed in contraction territory for the second month in a row, moments ago the Caixin/Markit China manufacturing PMI confirmed that China's manufacturing sector is effectively in recession, when it tumbled from 49.7 in December to 48.3 (from 51.5 a year ago), its second consecutive month in contraction territory, and missing estimates of a 49.6 print. This was the lowest print in the series of the revised index which came online in March of 2016. The 1.4 post slump may not sound like a lot, but it was the biggest drop in the series' 3 year history. Among the key indicators, output fell to 48.1 from 50.3 in Dec, the lowest reading since June 2016 and reverses the recent expansion trend; Meanwhile, new orders also fell vs prior month, sliding to the lowest reading since Sept. 2015. In the monthly report, Caixin said that the latest survey data signaled subdued overall operating conditions in the Chinese manufacturing sector at the start of 2019. Production and total new work were both slightly down at the start of the year, despite a renewed increase in export orders. Relatively muted demand conditions underpinned the first fall in purchasing activity for 20 months, while firms also registered lower inventories of both purchased and finished items. There was a silver lining in the employment and confidence indicators: workforce numbers at manufacturing firms in China fell only slightly in January. Furthermore, the rate of reduction was the slowest seen for nine months. At the same time, companies reported a further modest increase in the amount of outstanding orders. The softer fall in employment was accompanied by a slight improvement in business confidence. Notably, sentiment regarding the 12-month business outlook was at its most positive since May 2018. Some firms anticipate new products and planned company expansions to boost output over the next year. That said there was no mistaking what was an almost uniformly negative print, as manufacturers also adopted a cautious approach to inventories, as firms reduced their holdings of both stocks of purchases and finished items at the start of 2019. After broadly stabilizing at the end of 2018, average suppliers’ delivery times also increased across China’s manufacturing sector in January. More concerning is that deflation appears to be re-emerging, because in contrast to the marked increases seen through most of 2018, average input costs faced by Chinese manufacturers fell for the second month running. "According to panelists, lower cost burdens were due to reduced prices for raw materials. At the same time, output charges also fell in January, amid reports of a general drop in market prices." Commenting on the poor print, Zhengsheng Zhong said "The subindex for new orders dipped further into contractionary territory, pointing to a moderate contraction in demand across the manufacturing sector. 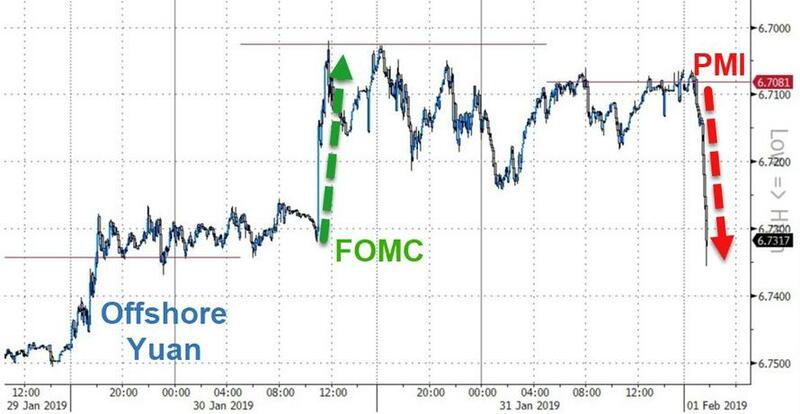 Yet the gauge for new export orders rose notably above the 50 level, the dividing line that separates contraction from expansion, reaching its highest point since March 2018, showing that companies’ export orders have obviously rebounded since the truce in the China-U.S. trade war." So some good news, perhaps? Well, not really, because as the report admitted, "on the whole, countercyclical economic policy hasn’t had a significant effect. While domestic manufacturing demand shrank, external demand turned positive and became a bright spot amid positive progress in Sino-U.S. trade talks. As companies were more willing to reduce their inventories, their output declined, indicating notable downward pressure on China’s economy." The report's conclusion: "China is likely to launch more fiscal and monetary measures and speed up their implementation. Yet the stance of stabilizing leverage and strict regulation hasn’t changed, which means the weakening trend of China’s economy will continue." Following the report, the Yuan tumbled almost 300 pips, falling for the first time in 8 days, and undoing much of the recent trade talk optimism.